For other uses of "epic", see Epic (disambiguation). An epic poem, epic, epos, or epopee is a lengthy narrative poem, ordinarily involving a time beyond living memory in which occurred the extraordinary doings of the extraordinary men and women who, in dealings with the gods or other superhuman forces, gave shape to the moral universe that their descendants, the poet and his audience, must understand to understand themselves as a people or nation. Another type of epic poetry is epyllion (plural: epyllia), which is a brief narrative poem with a romantic or mythological theme. The term, which means "little epic", came into use in the nineteenth century. It refers primarily to the erudite, shorter hexameter poems of the Hellenistic period and the similar works composed at Rome from the age of the neoterics; to a lesser degree, the term includes some poems of the English Renaissance, particularly those influenced by Ovid. The most famous example of classical epyllion is perhaps Catullus 64. The English word epic comes from the Latin epicus, which itself comes from the Ancient Greek adjective ἐπικός (epikos), from ἔπος (epos), "word, story, poem". Originating before the invention of writing, primary epics were composed by bards who used complex rhetorical and metrical schemes by which they could memorize the epic as received in tradition and add to the epic in their performances. Hence aside from writers like Dante, Camões, and Milton, Apollonius of Rhodes in his Argonautica and Virgil in Aeneid adopted and adapted Homer's style and subject matter, but used devices available only to those who write, and in their works Nonnus' Dionysiaca and Tulsidas' Sri Ramacharit Manas also used stylistic elements typical of epics. 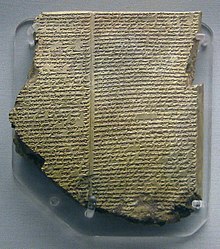 The oldest epic recognized is the Epic of Gilgamesh (c. 2500–1300 BCE), which was recorded In ancient Sumer during the Neo-Sumerian Empire. The poem details the exploits of Gilgamesh, the king of Uruk. Although recognized as a historical figure, Gilgamesh, as represented in the epic, is a largely legendary or mythical figure. The longest epic written is the ancient Indian Mahabharata, which consists of 100,000 ślokas or over 200,000 verse lines (each shloka is a couplet), as well as long prose passages, so that at about 1.8 million words it is about four times the length of the Rāmāyaṇa, and roughly ten times the length of the Iliad and the Odyssey combined. Famous examples of epic poetry include the Sumerian Epic of Gilgamesh, the ancient Indian Mahabharata and Rāmāyaṇa, the Tamil Silappatikaram, the Persian Shahnameh, the Ancient Greek Odyssey and Iliad, Virgil's Aeneid, the Old English Beowulf, Dante's Divine Comedy, the Finnish Kalevala, the German Nibelungenlied, the French Song of Roland, the Spanish Cantar de mio Cid, the Portuguese Os Lusíadas, John Milton's Paradise Lost, and Adam Mickiewicz's Pan Tadeusz. The first epics were products of preliterate societies and oral history poetic traditions. Oral tradition was used alongside written scriptures to communicate and facilitate the spread of culture. In these traditions, poetry is transmitted to the audience and from performer to performer by purely oral means. Early twentieth-century study of living oral epic traditions in the Balkans by Milman Parry and Albert Lord demonstrated the paratactic model used for composing these poems. What they demonstrated was that oral epics tend to be constructed in short episodes, each of equal status, interest and importance. This facilitates memorization, as the poet is recalling each episode in turn and using the completed episodes to recreate the entire epic as he performs it. Parry and Lord also contend that the most likely source for written texts of the epics of Homer was dictation from an oral performance. Milman Parry and Albert Lord have argued that the Homeric epics, the earliest works of Western literature, were fundamentally an oral poetic form. These works form the basis of the epic genre in Western literature. Nearly all of Western epic (including Virgil's Aeneid and Dante's Divine Comedy) self-consciously presents itself as a continuation of the tradition begun by these poems. Classical epic poetry employs a meter called dactylic hexameter and recounts a journey, either physical (as typified by Odysseus in the Odyssey) or mental (as typified by Achilles in the Iliad) or both. Epics also tend to highlight cultural norms and to define or call into question cultural values, particularly as they pertain to heroism. In his work Poetics, Aristotle defines an epic as one of the forms of poetry, contrasted with lyric poetry and with drama in the form of tragedy and comedy. The setting is vast, covering many nations, the world or the universe. Begins with an invocation to a muse (epic invocation). Begins with a statement of the theme. Includes the use of epithets. Contains long lists, called an epic catalogue. Features long and formal speeches. Shows divine intervention on human affairs. Features heroes that embody the values of the civilization. Often features the tragic hero's descent into the underworld or hell. The hero generally participates in a cyclical journey or quest, faces adversaries that try to defeat him in his journey and returns home significantly transformed by his journey. The epic hero illustrates traits, performs deeds, and exemplifies certain morals that are valued by the society the epic originates from. Many epic heroes are recurring characters in the legends of their native culture. Proposition: Opens by stating the theme or cause of the epic. This may take the form of a purpose (as in Milton, who proposed "to justify the ways of God to men"); of a question (as in the Iliad, which Homer initiates by asking a Muse to sing of Achilles' anger); or of a situation (as in the Song of Roland, with Charlemagne in Spain). In medias res: narrative opens "in the middle of things", with the hero at his lowest point. Usually flashbacks show earlier portions of the story. Enumeratio: Catalogues and genealogies are given. These long lists of objects, places, and people place the finite action of the epic within a broader, universal context. Often, the poet is also paying homage to the ancestors of audience members. Epithet: Heavy use of repetition or stock phrases: e.g., Homer's "rosy-fingered dawn" and "wine-dark sea". Many verse forms have been used in epic poems through the ages, but each language's literature typically gravitates to one form, or at least to a very limited set. Ancient Sumerian epic poems did not use any kind of poetic meter and lines did not have consistent lengths; instead, Sumerian poems derived their rhythm solely through constant repetition, with subtle variations between lines. Indo-European epic poetry, by contrast, usually places strong emphasis on the importance of line consistency and poetic meter. Ancient Greek and Latin poems were written in dactylic hexameter. Old English, German and Norse poems were written in alliterative verse, usually without rhyme. Italian, Spanish and Portuguese long poems were usually written in terza rima  or especially ottava rima. From the 14th century English epic poems were written in heroic couplets, and rhyme royal, though in the 16th century the Spenserian stanza and blank verse were also introduced. The French alexandrine is currently the heroic line in French literature, though in earlier periods the decasyllable took precedence. In Polish literature, couplets of Polish alexandrines (syllabic lines of 7+6 syllables) prevail. In Russian, iambic tetrameter verse is the most popular. In Serbian poetry, the decasyllable is the only form employed. ^ Michael Meyer, The Bedford Introduction to Literature (Bedford: St. Martin's, 2005), 2128. ISBN 0-312-41242-8. ^ "Epyllion". www.britannica.com. Retrieved 21 February 2019. ^ Lawall, Sarah N.; Mack, Maynard, eds. (1999). Norton Anthology of World Masterpieces: The Western Tradition. 1 (7 ed.). New York: W.W. Norton. pp. 10–11. ISBN 978-0-393-97289-4. ^ James G. Lochtefeld (2002). The Illustrated Encyclopedia of Hinduism: A-M. The Rosen Publishing Group. p. 399. ISBN 978-0-8239-3179-8. ^ T.R.S. Sharma; June Gaur; Sahitya Akademi (2000). Ancient Indian Literature: An Anthology. New Delhi: Sahitya Akademi. p. 137. ISBN 978-81-260-0794-3. ^ Jack Goody (1987). The Interface Between the Written and the Oral. Cambridge University Press. pp. 110–121. ISBN 978-0-521-33794-6. ^ a b Taken from William Harmon and C. Hugh Holman, A Handbook to Literature, 8th ed., Prentice Hall, 1999. ^ Battles, Paul (2014). "Toward a Theory of Old English Poetic Genres: Epic, Elegy, Wisdom Poetry, and the "Traditional Opening"". Studies in Philosophy. 111,1: 1–34. doi:10.1353/sip.2014.0001 – via Project MUSE. ^ Hexameter, poetry at Encyclopædia Britannica. ^ Alliterative verse literature at Encyclopædia Britannica. ^ Terza rima, poetic form at Encyclopædia Britannica. ^ Ottava rima, poetic form at Encyclopædia Britannica. ^ Heroic couplet, poetry at Encyclopædia Britannica. ^ Rhyme royal, poetic form at Encyclopædia Britannica. ^ Spenserian stanza, poetic form at Encyclopædia Britannica. ^ Blank verse, poetic form at Encyclopædia Britannica. ^ See: Trzynastozgłoskowiec, [in:] Wiktor Jarosław Darasz, Mały przewodnik po wierszu polskim, Kraków 2003 (in Polish). ^ Meyer, Early Tahitian Poetics. ^ Robert William Seton-Watson, The Spirit of the Serb. Jan de Vries: Heroic Song and Heroic Legend ISBN 0-405-10566-5. Hashmi, Alamgir (2011). "Eponymous Écriture and the Poetics of Reading a Transnational Epic". Dublin Quarterly, 15. Frye, Northrup (2015) . Anatomy of Criticism. Princeton, NJ: Princeton University Press. ISBN 978-1-4008-6690-8. Cornel Heinsdorff: Christus, Nikodemus und die Samaritanerin bei Juvencus. Mit einem Anhang zur lateinischen Evangelienvorlage, Untersuchungen zur antiken Literatur und Geschichte 67, Berlin/New York 2003, ISBN 3-11-017851-6. Jansen, Jan and J Henk M.J. Maier, eds. 2004. Epic Adventures: Heroic Narrative in the Oral Performance Traditions of Four Continents (Literatur: Forschung und Wissenschaft, 3.) LIT Verlag. Parrander, Patrick (1980). "Science Fiction as Epic". Science Fiction: Its Criticism and Teaching. London: Methuen. pp. 88–105. Tillyard, E.M.W. (1966) . The English Epic and Its Background. New York: Oxford UP. Wilkie, Brian (1965). Romantic Poets and Epic Tradition. University of Wisconsin Press. This page is based on the Wikipedia article Epic poetry; it is used under the Creative Commons Attribution-ShareAlike 3.0 Unported License (CC-BY-SA). You may redistribute it, verbatim or modified, providing that you comply with the terms of the CC-BY-SA.